Spark Erosion is a successful form of machining difficult materials, shapes and sizes this is because there are no cutting forces. With over 30 years’ experience in Spark Erosion, deliver high specification Erosion Machining for your company. Our Spark Erosion Machine is a very useful process in the Engineering Industry; it allows you to remove material in a highly controlled way. How Does Spark Erosion Work? You start with a workpiece (usually metallic) it could be steel or aluminium. You now need an electrode which can be any shape from a simple cylinder or complex polygon; CNC milled brush head or diaphragm! The electrode is precisely mounted on the machine head and aligned with the direction of travel. When everything is positioned correctly, the process can then begin. The workpiece is then usually submerged in dielectric liquid. The clever motion hydraulics and electronics allow the electrode to move closer to the workpiece; the small sparks jump between the electrode and workpiece gently cutting your workpiece. 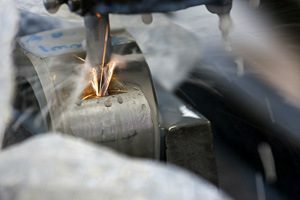 A hot plasma known as the spark (electrical discharge) melts the workpiece creating a puddle. It then vaporises a small amount of dielectric creating air bubbles around the spark. This is repeated roughly over 10,000 times in one second. Clearing the working area is important; the head is located to flush the area, which can speed up the metal removal time. The result is related to the spark size, for example, big and long sparks lead to a bigger depth which gives a rougher surface. The wear rate is related to the removal rate and the slower the removal rate is, the higher the wear. If you are looking for a finer finish than smaller sparks, low removal rates, and higher wear rates are needed. Some copper alloys have been designed for spark eroding and give a greater machinability and better wear resistance. Sodick Wire EDM is one of the leading machines in the industry. Using automatic tool changers allows the machine to work extremely accurate and fast. One of the projects this device has been used on is assisting in the manufacture of a run of Inconel components for a U.S. Oil & Gas customer. Here at MNB, we have a variety of Spark Erosion Machines including two ACU-RITE 111 CDH-2AM (high-speed EDM drills), and one SODICK A65R MK 21. Our Spark Eroders are the most efficient machines for dealing with complicated shapes or materials. These machines allow us to add very precise detail to even the hardest of materials. Timely & Flexible – We are highly-flexible, able to produce large and small prototypes to meet deadlines. We help through the whole process including offering solutions manufacturing and material selection. Technology Driven – We use state-of-the-art technology machinery and materials, along with our qualified professionals. Using only the best machinery allows us to create our high-quality products. Highly Reputable – With 30 years’ experience, our Engineers manufacture tailored products to suit specification needs. We have worked with clients including Mercedes Benz, Honda, Alstom Power Ltd and more. Quality – High-quality products are assured here at MNB Precision. All products, large and small, go through testing and must pass all checks before they are handed to our clients. For more information on Spark Erosion, Wire Erosion, Jig Boring or any of our other services, contact us on 02476 695959. Fancy working for us? Check out our careers page.